Can LG Smart TV play 3D movie files? Why LG TV can play some of the 3D videos but not others? What video formats does an LG 4K TV/3D TV/LED TV/Smart TV support? What if we are unable to view 3D films on new LG TV? How to create playable 3D format for LG TV? If you are stuck in the above any one issue, you are in the right place. Read on this passage and all what your doubts will be dismissed. It offers the solution to download and watch 3D movies on LG TV. If you like enjoying 3D movies on big screen, such as playing 3D movies on LG 3D TV or watching 3D movies on LG Smart TV, you will be in trouble. 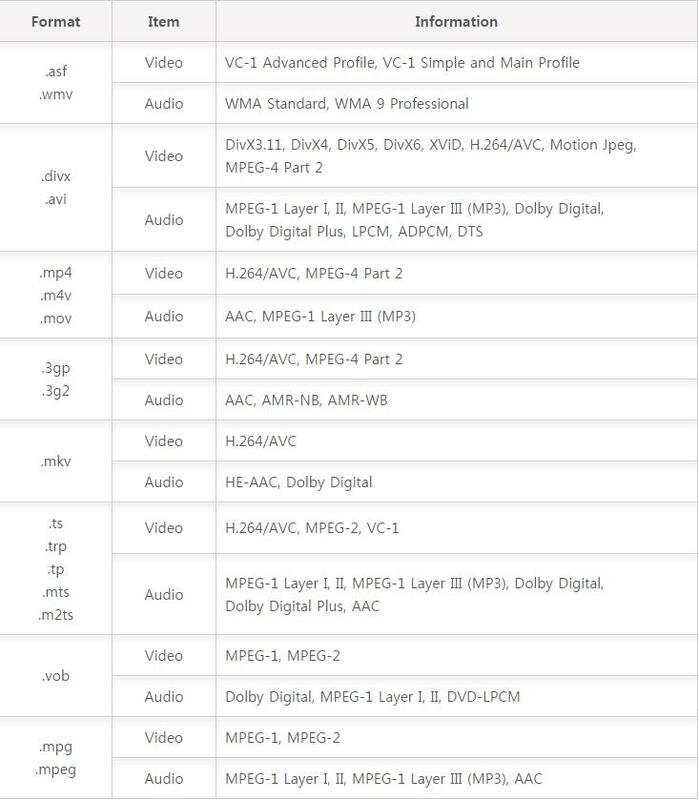 Because of the playable format of LG TV have strict requirements above, such as: some MKV movie files(downloaded from Internet or some raw Blu-ray rips in MKV) in 2D or 3D SBS(Side-by-Side) work on LG TV, but the audio has to be encoded in AAC or MP3 for stereo. AC3 audio and DTS Dolby don't seem to work, which is really a great pity. Convert videos in any format to 3D including 3D MP4, 3D MKV, 3D WMV, 3D AVI, 3D YIFY, 3D YouTube and more. Transcode almost all the 2D videos, Blu-ray, DVD disk to enjoy on a bigger screen LG TV. Edit videos with the great video editing functions like trimming, cropping, adding subtitle, etc. Optimized presets for converting video directly to devices like iPhone, iPad, and Android phones. Adjust the depth from 0 to 60 to find a comfortable view and preview 3D effects in real-time to ensure whether the 3D effects are suitable. 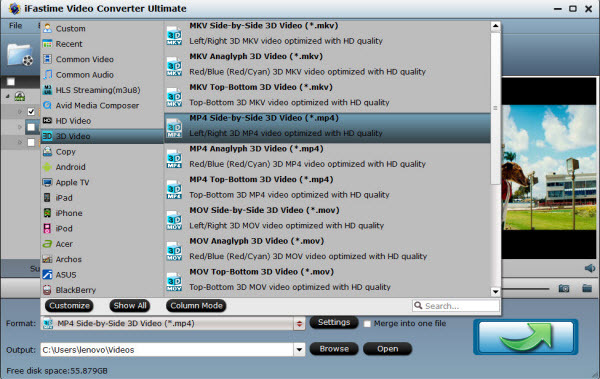 This 3D video converter is reasonably priced and easy to use. Download the free trial version below. After downloading the LG TV 3D video converter, install and run it. Note that this guide uses the screenshots of Video Converter Ultimate for Windows (Windows 10 and 8.1 included) version. 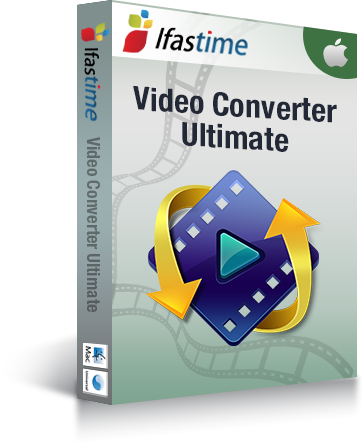 If you want to change the 3D format on Mac, please turn to iFastime 3D Video Converter Mac to solve all the problems. How to convert 3D movies to SBS 3D MP4/MKV for LG TV? And you can add multiple files to save your time for this program supports batch conversion. Tips: Besides powerful conversion capability, this program also provides some very solild editing functions. Simply click the "Edit selected task" button beside each clip to open the Video Edit window and do some video editing like cropping, trimming, adding watermarks, adjusting video effects, etc. till you get it just the way you like it. Click the "Format" icon on the right to open the format drop-down list. 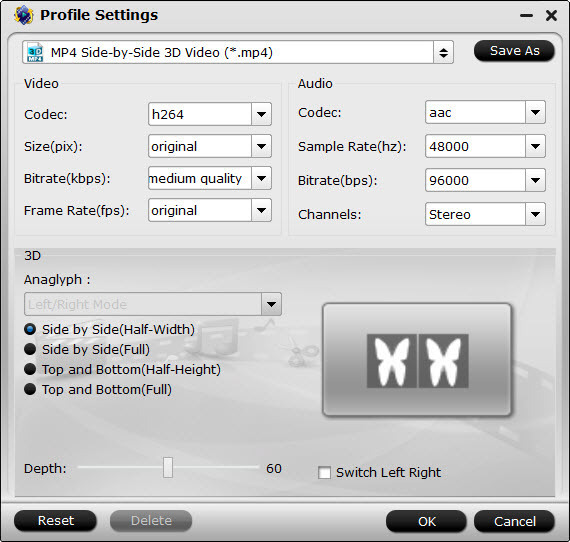 Then select "MP4 Side-by-Side 3D Video (*.mp4)" or "MKV Side-by-Side 3D Video (*.mkv)" for LG 3D TV. Or you can also choose H.264 MP4 format for LG LED TV/Smart TV and H.265 MP4 for LG 4K Ultra HD TV. Tip: If you think the video size this not suitable for your LG TV, you can first choose any one of the provided type, then change the settings. Please remember the file size is based more on bitrate than resolution which means bitrate higher results in bigger file size, and lower visible quality loss. Also, you can choose a proper 3D type and adjust the depth. After all necessary settings and editing, simply press the "Start conversion" button to start the 3D movie conversion. Now go have a cup of coffee or take a nap; Video Converter will do the hard work, running in the background. After conversion, the newly created 3D SBS MP4 video file is now LG TV friendly and will play flawlessly. Just transfer them to your LG TV. Anaglyph 3D, commonly seen in Red/Cyan, is the old school way to watch 3D content. The left video image is tinted blue and the right video image is tinted red. Both videos are then overlaid on top of each other and when you are wearing ored/blue glasses the image will appear 3D. The picture is always not that good, but it's really costless to watch Red/Cyan Anaglyph 3D, stereoscopic glasses are common and cheap, even often coming free with magazines showing 3D. Moreover, we can view 3D files in anaglyph formats using red/blue glasses on computers, televisions, online at video 3D sharing sites like YouTube, projectors, mobile phones and in print. Side-by-side or left and right 3D, consisting of two halves of the left and right, with the entire frame for the left eye scaled down horizontally to fit the left-half of the frame, and the entire frame for the right eye scaled down horizontally to fit the right side of the frame. Thus, in the case of 720p content (resolution of 1280 x 720), each frame will actually consist of the horizontally scaled frame for the left eye with a resolution of 640 x 720 and adjacent to it, the corresponding frame for the right eye at the same 640×720 resolution. The quality of picture is much higher than Anaglyph. However, to watch the active 3D televisions need the active shutter glasses, then the left and right images flash so quickly so that the human eye is tricked into seeing both left and right images as one 3D image. Where are the 3D movies come from? For some markets, the video rental giant offers 3D streaming videos. The number of markets is still pretty limited, but the service works on the Playstation 3 and on LG TVs, and it's available in some international markets, too. Don't let the title fool you, this site is rich with 3D content, mostly in the form of BluRay movies. You can find movies in a number of categories, including documentary, action, drama, comedy, family-friendly, animation, horror and thriller, mystery, romance, science fiction and fantasy, and TV shows. This online service lets you rent BluRay and 3D BluRay movies, and they have a suggestion box to recommend a movie you'd like to be able to rent from them. The service also offers customer comments so you can get reviews from peers. The internet's biggest store now offers 3D movies, both for sale and for streaming on the Prime instant video service. Many of their offerings are in the BluRay format. Amazon also sells the players to be able to watch the videos on when you get them at home, making it a convenient one-stop shop. This Walmart service allows you to rent 3D movies and TV shows easily. You can rent your selection for 24 hours with unlimited plays during that time. You must be able to connect to the internet and download your content. The first of our streaming on demand services is powered by AT & T. UVerse uses MPEG-4 coding and a high-tech box that receives the stream from UVerse via internet protocol, instead of cable like other services use. The cable internet and television giant now offers 3D on their on demand service, including HBO movies. Select markets might also have a 3D channel available with content available all the time, including movies, TV shows, and sports. Sony has their own 3D section on their entertainment network that streams movies directly to the PlayStation 3 via their Video Unlimited service. The system allows you to search the list and pick out the movie you want. This service is all about renting just 3D movies. You can choose from three different plans that you pay for by the month that let you keep one, two, or three discs at a given time. Shipping the DVDs both directions is free. This chain of video and game rental stores is available in 19 states and Canadian provinces. Membership is done in-store, and new members get half off their rentals for the first month. FV does not offer online sign-ups at this time. Perfectly handle an extensive list of video file types with impressive output quality on Mac OS X.